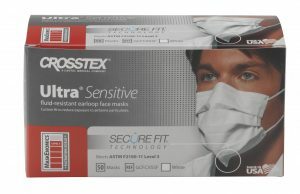 Ultra-Sensitive Mask is an ear-loop design specifically for users with sensitive skin. The product is free of chemicals, inks, dyes and fragrance and has a fluid-resistant outer layer with a white hypoallergenic inner cellulose layer. Each Ultra-Sensitive Mask is constructed with an extra-long, aluminum nose piece and is designed not to lint, tear or shred. Ultra-Sensitive Face Mask is also available in No Fog and No Fog with Shield versions. 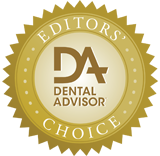 Ultra Sensitive Mask was evaluated by 28 consultants in 987 clinical uses and received a 91% clinical rating. The extra-long aluminum nose piece of Ultra-Sensitive Mask provides a comfortable fit that remains formed to the nose, even during lengthy procedures. It was reported that the softness of the mask was very good and that those with skin sensitivities were able to wear it without irritation. This mask is a level 5 mask (ASTM high performance rating) – perfect for long procedures where typically heavy to moderate amounts of fluid are produced. Several evaluators stated that they appreciated the lack of chemical odors. Overall, 43% of consultants reported that the Ultra-Sensitive Mask was better than their current face mask and 74% would recommend itto colleagues. Adapt the mask closely to the nose to prevent air leakage upward, especially if glasses or loupes are worn. Be sure to pull mask over your chin.